Azadmehr, A., Hajiaghaee, R., Molla Hassan, A., Jafari Vesiehsari, M., Oladnabidozin, M. (2016). Splenocyte proliferation, NK cell activation and cytokines production by extract of Scrophularia variegata; an in vitro study on mice spleen cells. 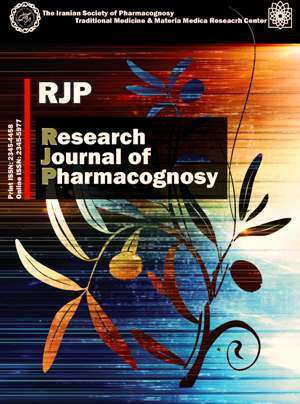 Research Journal of Pharmacognosy, 3(4), 9-15. A. Azadmehr; R. Hajiaghaee; A.T. Molla Hassan; M. Jafari Vesiehsari; M. Oladnabidozin. "Splenocyte proliferation, NK cell activation and cytokines production by extract of Scrophularia variegata; an in vitro study on mice spleen cells". Research Journal of Pharmacognosy, 3, 4, 2016, 9-15. Azadmehr, A., Hajiaghaee, R., Molla Hassan, A., Jafari Vesiehsari, M., Oladnabidozin, M. (2016). 'Splenocyte proliferation, NK cell activation and cytokines production by extract of Scrophularia variegata; an in vitro study on mice spleen cells', Research Journal of Pharmacognosy, 3(4), pp. 9-15. Azadmehr, A., Hajiaghaee, R., Molla Hassan, A., Jafari Vesiehsari, M., Oladnabidozin, M. Splenocyte proliferation, NK cell activation and cytokines production by extract of Scrophularia variegata; an in vitro study on mice spleen cells. Research Journal of Pharmacognosy, 2016; 3(4): 9-15. 1Immunology Department, Babol University of Medical Sciences, Babol, Iran. 3Department of Immunology, Faculty of Medical Sciences, Islamic Azad University Babol Branch, Babol, Iran. 4Department of Genetic, Babol University of Medical Sciences, Babol, Iran. 5Gorgan Congenital Malformations Research Center, Golestan University of Medical Sciences, Gorgan, Iran. Department of Medical Genetics, School of Advanced Technologies in Medicine, Golestan University of Medical Sciences, Gorgan, Iran. Background and objectives:Scrophularia variegata M. Beib. (Scrophulariaceae) is a medicinal plant, used for various inflammatory diseases in Iranian Traditional Medicine. In the present study, we evaluated the immune modulation and antioxidant effects of the hydroalcoholic extract of S. variegata. Methods: The splenocytes were harvested from the spleen of Balb/c mice and were cultured. The splenocyte proliferation, NK cell activity, cytokines production and antioxidant effects were evaluated by MTT assay, enzyme- linked immunosorbent assay (ELISA) and DPPH assay, respectively. Results: The S. variegata extract significantly increased splenocyte proliferation. The results indicated that the extract increased NK cell cytotoxicity of Yac-1 tumor cells and at the concentration of 50-200 µg/mL significantly increased IFN-γ and IL-2 cytokines, although the level of IL-4 cytokine was significantly reduced. The antioxidant activity was observed in the extract with IC50 302.34±0.11 μg/mL. Conclusion: The increasing in the splenocyte proliferation, anti-tumor NK cell cytotoxicity and cytokine secretion were indicated as potent immunomodulatory effects. These results suggest that S. variegata could be considered in the treatment of immunopathological disorders such as allergy and cancer; however, future studies are necessary. Till SJ, Francis JN, Nouri-Aria K, Durham SR. Mechanisms of immunotherapy. J Allergy Clin Immunol. 2004; 113(6): 1025-1034. Martin JT. Sexual dimorphism in immune function: the role of prenatal exposure to androgens and estrogens. Eur J Pharmacol. 2000; 405(1): 251-261. Kiwamoto T, Ishii Y, Morishima Y, Yoh K, Maeda A, Ishizaki K, Iizuka T, Hegab AE, Matsuno Y, Homma S. Transcription factors T-bet and GATA-3 regulate development of airway remodeling. Am J Respir Crit Care Med. 2006; 174(2): 142-151. Henderson HM. The physicians of myddfai: the Welsh herbal tradition. Bot J Scotland. 1994; 46(4): 623-627. Azadmehr A, Hajiaghaee R, Mazandarani M. Induction of apoptosis and G2/M cell cycle arrest by Scrophularia striata in a human leukaemia cell line. Cell Proliferat. 2013; 46(6): 637-643. Azadmehr A, Oghyanous KA, Hajiaghaee R, Amirghofran Z, Azadbakht M. Antioxidant and neuroprotective effects of Scrophularia striata extract against oxidative stress-induced neurotoxicity. Cell Mol Neurobiol. 2013; 33(8): 1135-1141. Azadmehr A, Maliji G, Hajiaghaee R, Shahnazi M, Afaghi A. Inhibition of pro-inflammatory cytokines by ethyl acetate extract of Scrophularia striata. Trop J Pharm Res. 2013; 11(6): 893-897. Motamed SM, Bush S, Rouzbahani SH, Karimi S, Mohammadipour N. Total phenolic and flavonoid contents and antioxidant activity of four medicinal plants from Hormozgan province, Iran. Res J Pharmacogn. 2016; 3(3): 17-26. Noda Y, Anzai K, Mori A, Kohno M, Shinmei M, Packer L. Hydroxyl and superoxide anion radical scavenging activities of natural source antioxidants using the computerized JES‐FR30 ESR spectrometer system. IUBMB Life. 1997; 42(1): 35-44. Koleva II, van Beek TA, Linssen JP, Groot A, Evstatieva LN. Screening of plant extracts for antioxidant activity: a comparative study on three testing methods. Phytochem Analysis. 2002; 13(1): 8-17. Kessler M, Ubeaud G, Jung L. Anti‐and pro‐oxidant activity of rutin and quercetin derivatives. J Pharm Pharmacol. 2003; 55(1): 131-142. Katayama S, Nishio T, Kishimura H, Saeki H. Immunomodulatory properties of highly viscous polysaccharide extract from the Gagome alga (Kjellmaniella crassifolia). Plant Foods Hum Nutr. 2012; 67(1): 76-81. Zhao M, Wang Q, Ouyang Z, Han B, Wang W, Wei Y, Wu Y, Yang B. Selective fraction of Atractylodes lancea (Thunb.) DC. and its growth inhibitory effect on human gastric cancer cells. Cytotechnology. 2014; 66(2): 201-208. Sim GC, Radvanyi L. The IL-2 cytokine family in cancer immunotherapy. Cytokine Growth Factor Rev. 2014; 25(4): 377-390. Ho CY, Lau CBS, Kim CF, Leung KN, Fung KP, Tse TF, Chan HHL, Chow MSS. Differential effect of Coriolus versicolor (Yunzhi) extract on cytokine production by murine lymphocytes in vitro. Int Immunopharmacol. 2004; 4(12): 1549-1557. Spagnuolo C, Russo M, Bilotto S, Tedesco I, Laratta B, Russo GL. Dietary polyphenols in cancer prevention: the example of the flavonoid quercetin in leukemia. Ann NY Acad Sci. 2012; 1259(1): 95-103. Boubaker J, Bhouri W, Ben Sghaier M, Ghedira K, Dijoux Franca MG, Chekir Ghedira L. Ethyl acetate extract and its major constituent, isorhamnetin 3-O-rutinoside, from Nitraria retusa leaves, promote apoptosis of human myelogenous erythroleukaemia cells. Cell Proliferat. 2011; 44(5): 453-461.